1—Horizons is a progressive firm with a vision for the present-day market. 2—Horizons is imbued with European and East Asian cultural elements. 3—Horizons philosophy is embedded in the services the firm provides. 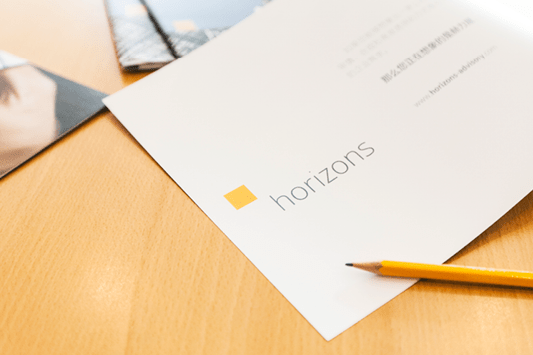 For the first thirty years, Horizons (formerly Ruiheng Consulting) served primarily Europe-based clients looking for new opportunities in Asia. The firm operated as a gateway to emerging Asian markets whose irresistibly bright light was calling. In our original logo (Fig. 1), the gateway “door” is represented in the logo’s centre, right-facing, orange square within the larger square, its colour representing the sunny allure of the East’s emerging markets (1). In contrast, the two black squares abutting the door are a symbol of the West’s continual entrepreneurial and economic decline (2). The white, centre square is a ray of light, illuminating the opening to Asia (3); its enveloping squares coloured bronze by the intense heat emanating from the red-hot Asian markets (4). Symbolically, the square form and its differing colours transform one another according to the principle of cause and effect. For the first thirty years, Horizons guided clients as they boldly ventured east; our people formed a square around them, advising, guiding and safeguarding them through investments lifecycle. The period of transitioning from one era to another is nearly complete for Horizons. Where we once held steady to the investment advisory model and our industry’s singular, often rigid way of ‘doing things’, we now live in an era of global disruption and nimble adaptability under the sun of a new century. The legal services industry, like so many, is in the midst of disruptive change. Alternative platforms are already making inroads in the market and, in some instances, providing a new, better options for today’s ‘real-world’, cross-border business environment. Horizons services have evolved, and come to be tailor made for those who’ve forgone the West’s lingering 20th-century rigidity to embrace the fast-moving, ever shifting paradigm that the new market calls for. Under the sun of a new century, dynamism has become the hallmark of the east. This does not mean that we should forgo the intrinsic value of the west, but it is undeniable the world perspective has radically changed. From an Asian worldview, the sun was and is; the sun moves and we move with it. Horizons current logo mark, created in 2014, is bright, sun-gold square that reflects a changed world and a firm having changed with it (Fig. 2). The square mark borrows from and is inspired by the martial discipline Aikido, whose way and principle of harmonising is indicated by the Triangle (stance), Circle (movement) and Square (stability) forms (Fig. 3). In the Aikido triptych, the Square represents a mature form. It is considered the diamond element — solid, stable, real and well-proportioned; it concentrates on a single point and is the basis of the total control necessary for proper execution. Proper execution is paramount to our mission at Horizons. In this, we are guided by the Square’s core principle of playing from strength, remaining grounded and dependable. It’s not only what our clients expect, it’s what they deserve. We’re proud or our history and proud of the Horizons logo as a unique symbol of who we are and what we represent as a trustworthy corporate advisory firm that clients can count on. Post by David Pandt, Horizons China communications manager and editor of The Square. If you would like to talk with us about our brand identity or other corporate advisory related items, email us at talktous@horizons-advisory.com, and we’ll have a Horizons professional contact you.